The Feast of St. Paisy Velichkovski in the Monastery of Noul Neamt, community of Chitcani, Bender region, gathered on the first day of the Nativity of the Lord Fast, Wednesday, 28 November 2018, arch-pastors, priests, deacons, and numerous pilgrims united in the liturgical celebration. Two Divine Liturgies were celebrated simultaneously in two churches of the monastic settlement. 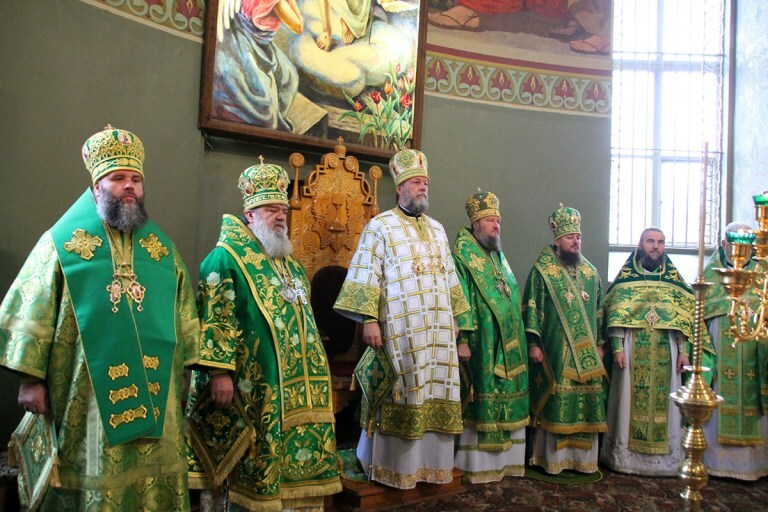 The first hierarch of the Moldovan Orthodox Church, Metropolitan Vladimir, conducted the Divine Service in the Holy Ascension Cathedral, sharing prayers with Archbishop Sava of Tiraspol and Dubasari, Bishop Nicodim of Edinet and Briceni, and Vicar Bishops Ioan of Soroca and Siluan of Orhei. Metropolitan Vikenty of Tashkent and Uzbekistan, together with Bishop Iriney of Orsk and Gai celebrated the Divine Liturgy in the Dormition of the Theotokos Church of the monastery. Venerable Paisy (Velichkovski), known in our church as St. Paisy of Neamt, was a virtuous monastic in the 18th c. Being a great father of the Church, he experienced isichastic theology and Jesus’ prayer, revived monastic living and played an important spiritual role in monasticism across the world. This feast was very special to Serghei Cebotari, student at the Theological Academy of Moldova, who was ordained deacon by Metropolitan Vladimir. With the blessing of Metropolitan Vladimir, Vicar Bishop Ioan of Soroca delivered a message of arch-pastoral guidance, congratulating the community of Noul Neamt on the feast of their heavenly protector who played crucial role in the development of the mother monastery in Neamt, Romania. Archimandrite Paisie (Cecan), the monk-superior of the Noul Neamt monastery, thanked the arch-pastor for prayers and spiritual strengthening. After the Liturgy, a commemoration service was officiated at the shrine of Bishop Dormedont of Edinet and Briceni.